Police investigate an incident at a bank on Mission and 23rd street. Photo by Lyida Chávez. 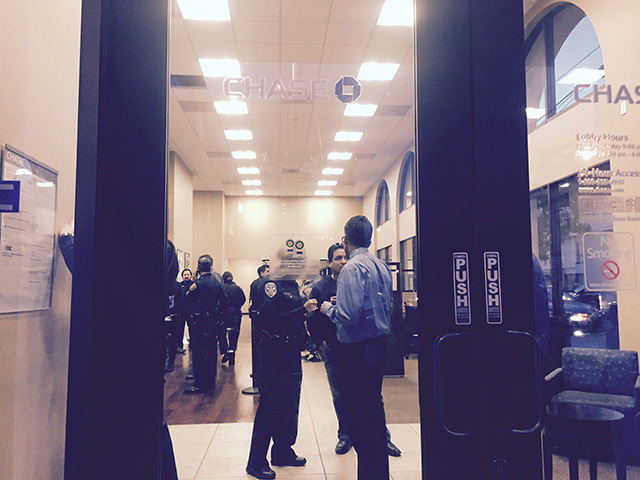 A possibly drunk and reportedly verbally aggressive man caused the shutdown of a Chase bank branch at 21st and Mission streets at around 5:15 p.m. Monday evening. One man who was inside the bank at the time said it looked like the man was disoriented, and that he was speaking to the teller as though he thought he was in a pawn shop. Another customer, Alice Haste, also said the man sounded as if he was trying to barter for something. “He was weird and aggressive, talking a lot.” Haste said. She guessed that someone then reported an attempted robbery. “A lot of things were happening at once,” she said. Police arrived at the scene to subdue and arrest the man, said another man who witnessed the arrest from outside the bank. SFPD could not immediately comment on the incident.